The Cairns Student Hub is managed by Study Cairns as a supportive environment that aims to enhance international students experience in Cairns. Supported by Trade and Investment Queensland, Cairns Regional Council, educational institutions and local business, the Student Hub forms the centrepiece of a thriving multi-cultural student community. Located in the heart of Cairns city, the Student Hub provides a welcoming space for students to utilise as a space to connect with fellow students, colleagues and the wider student community. The Student Hub builds on the Cairns International Student Engagement program, which ensures international students feel both welcome and safe, and experience a strong sense of belonging to the local community throughout their stay in Cairns. The Cairns International Student Engagement program improves the experience of international students studying and living in Cairns. It provides a connected network of touch points for students so they feel supported and can make the most of their time in the region. Other initiatives of this program are The International Student Friendship Ceremony, Airport Welcome Desks, student and community integration programs, collection of data and research on student needs, and marketing activities. Additionally, a Student Internship Program is under development and Volunteering opportunities are available at the Student Hub. The Student Hub is located at Shop 2, 93-105 Lake St (School of the Arts building, entry off Lake St). Opening Hours: Check our Facebook page for current opening hours. 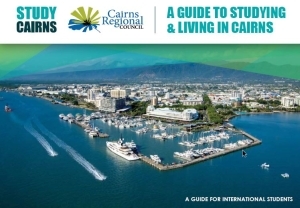 Study Cairns was established in 1997 and aims to unify providers of international education and international support services in promoting the Cairns Region as the preferred International Education destination in Queensland. Study Cairns cluster is the central point of contact for any business involving education, training or support services within the region. This includes student and agent enquiries along with education businesses wishing to expand their markets into this region. Study Cairns is also responsible for building relationships between local providers and students wishing to study/live or study/travel. It is also the key stakeholder that liaises with Department of Employment, Economic Development and Innovation, Department of Education and Training, Cairns Regional Council, Advance Cairns, Austrade and other industry bodies involved with increasing and improving education and training within Australia, Queensland and more importantly, Far North Queensland. Visit the Study Cairns website for more information.